This animal, with its body solidly planted on sturdy legs and its prominent eyelids, geometrical jaws and flaring nostrils, has an extraordinarily expressive look, symbolizing the strength of the Chinese horse. The curves and counter-curves of its morphology are deliberately accentuated and executed like a flowing brushstroke. It is a spirited, picturesque work, typical of Sichuan productions. Contacts with the peoples of Central Asia enabled the Chinese to discover new breeds of horses. Among the most highly sought-after were the swift steeds from Ferghâna (modern Uzbekistan) that inspired artistic creations which glorified their beauty. 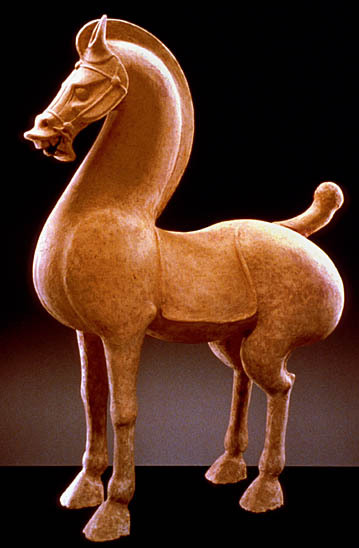 However, this type of figure should not however be taken to represent any specific breed as most often it involved a composite, idealized image combining the large pricked-up ears, sunken nose, and protruding, frog-like eyes of the Chinese horse with the tall head of the Arab breed. The figure was fired in a twin-section mould, and the lightly fired, flaky ochre material retained a natural aspect characteristic of works from the region. This statue probably belonged to a group of mingqi or tomb figures placed in the grave. The horse was an allegorical symbol of the aristocracy and as such featured in all tombs of high-ranking people. Under the Han dynasties the decoration and furnishings of the funeral chamber reflected the life of the deceased and testified to a will to survive beyond death. The statuettes thus represented the mortal world with an astonishing feeling for movement and grasp of essential gestures. In the case of some families the practice was a public affirmation of filial piety. This Confucian virtue regarded death as a pivotal stage between two lives linked by the tomb.